Whether you’d like to add a few winter interest plants to fill gaps in the border, or create a winter garden bed or a container garden by the door to welcome visitors, these plants are guaranteed to keep your outdoor space looking great throughout the cold season. 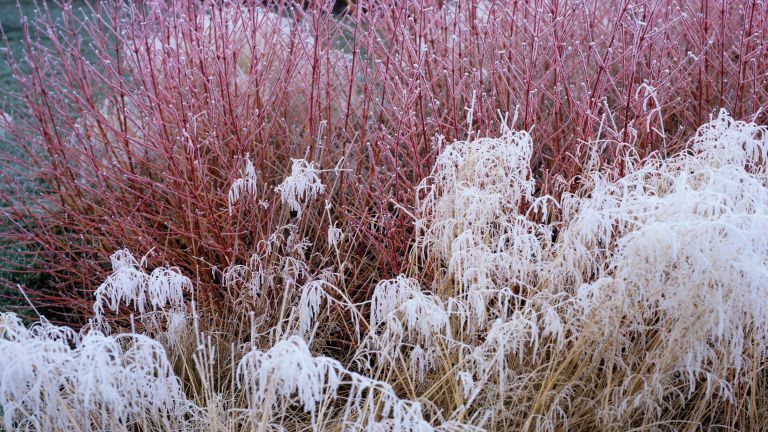 Once you're done reading, why not check out our tips for planning your winter garden? Sorbus are deciduous trees with berries in white, pink, yellow, orange, red and blue. They have small spring flowers and some have vibrant autumn colour. They do best in full sun or dappled shade in fertile, well-drained soil. Plant in a prominent position and underplant with early-flowering hellebores or bulbs such as crocus. Holly is a great evergreen choice with red, yellow or orange berries. Plant in spring or autumn in well-drained, slightly acidic soil in full sun, though they will grow well in part shade. They make lovely topiary specimens in containers or in a border. Mahonia is useful for scented floral colour in winter and has attractivr evergreen pinnate leaves. Good in well-drained or moist soils in shade or part-shade. Cut back after flowering to keep a manageable size. It provides a good backdrop to all other winter plants. Daphne may be slow-growing and quite expensive, but is worth it for its highly scented blooms. Place in a sheltered spot by a path to enjoy the fragrance close up. Daphnes need moist, well-drained neutral to slightly alkaline soil. Chimonanthus Praecox is a deciduous shrub with pendulous yellow blooms. Plant in full sun in fertile, well-drained soil in a protected spot where you can enjoy the perfume. Bring a few sprays inside as it looks wonderful in arrangements. Get more tips on how to grow a cutting garden. Callicarpa is a shrub grown for the jewel-like purple berries that cluster on its stems throughout autumn and winter. Does well in sun or dappled shade in most fertile soils. Cut back in spring to encourage berries. Works well with ornamental grasses and late season perennials. Viburnum Tinus has white flowers emerging from pink buds from December to April. Suits full sun or part shade in moderately fertile, well-drained moist soil or plant in containers and use to brighten a corner. Prunus Serrula has eye-catching bark that peels away in bands as the tree ages. Group in a small copse or as a specimen tree and underplant with cyclamen and snowdrops for a pretty effect. Grow in moist, well-drained soil in sun or part shade. Cornus 'Midwinter Fire' is a dwarf variety dogwood and does best in rich, slightly damp soil in full sun for the best colour. Plant en masse, as an informal hedge and underplant with snowdrops. Coppicing hard in early spring ensures good coloured stems. Hellebores prefer a sheltered position in semi-shade; they do well planted under deciduous trees. They tolerate most soils, but do best in rich, moist, free-draining soil or in raised beds so you can admire the nodding flowers more easily. Hamamelis (Witch Hazel) are deciduous shrubs with spider-like velvety flowers in golds, oranges and reds, which last around five weeks and can withstand frost. Plant them where you can get close to enjoy the scent. Witch hazel grows best in neutral to slightly acid free-draining soil in an open, sunny position. Skimmia Japonica 'Fragrans' is a compact evergreen shrub that is ideal for containers or a shady spot such as a woodland bed or border. They need fertile, moist, well-drained humus-rich soil. These plants are easy to care for and require little pruning. Attractive buds open to flowers in early spring.